India's squad that beat Pakistan in Bangalore in the 1996 World Cup: Where are they now? India vs. Pakistan in a World Cup is probably one of the most anticipated clashes in the cricketing world. India have never been defeated by Pakistan in a World Cup, be it the 50 over or 20 over format; the Indians lead their neighbours 6-0 in ODI World Cup and 4-0 in the T20 World Cup clashes. But the 1996 quarterfinal clash in Bangalore will remain etched in the memory of cricket fans as one of the most dramatic. The match had many ‘moments’, be it the Ajay Jadeja pyrotechnics with the bat at the closing stages of the Indian innings, or the infamous Venkatesh Prasad-Aamer Sohail face-off. The Mohammad Azharuddin-led Indian side scored 287 in their allotted 50 overs. Pakistan could only manage 248 in 49 overs (They were fined one over for slow over rate), handing India the semi-final berth. Pakistan were 84/0 in 10 overs in their chase, before a dramatic change of events scripted an India victory. 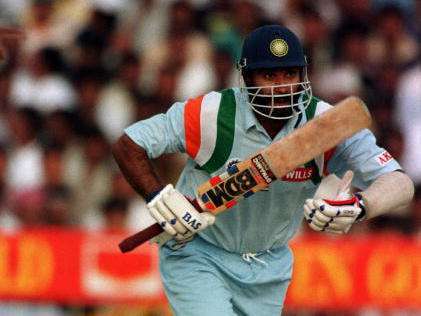 Sidhu hit an-115 ball 93 in the match and laid the foundation for the Indian innings. He went on to win the Man of the Match award for this performance. Sachin Tendulkar was largely expected to provide a scintillating start as he had done the whole tournament till that point, but he failed to get going and Sidhu took on the leading role in their opening partnership. After his retirement in ’99, he took up the mantle of commentator and cricket analyst for various channels. He is now as famous for his one-liners as he was for his towering sixers during his playing days. He has moved on to the entertainment industry, acting in films and judging reality shows. He can now be seen on the comedy show The Kapil Sharma Show. He has also been actively involved in politics, and was Member of Parliament from Amritsar from 2004-2014 on a BJP ticket. He is now a member of the Congress Party.